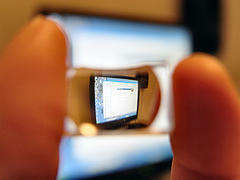 There are a variety of ways that you can measure the relative size of a web market opportunity. Two relatively easy ways to evaluate a market size are to research the number of searches (search volume) and to determine a relative sales volume. The easiest way to determine search volume is to use Google’s own keyword tool. There are other tools on the market (including my favorite- Market Samurai), but Google’s tool is free, and the data source is Google’s search engine which will most likely be your number one source of traffic. If you use the Google keyword tool for “elliptical trainer” you will find that there are 201,000 Global Monthly Searches or 135,000 Local Monthly Searches. Is this number big or small? Well, like everything, this number is relative…”elliptical trainer reviews” has 18,100 global searches while “treadmill” has 1,830,000 global searches. 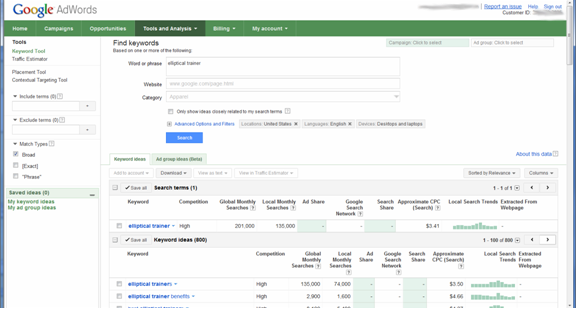 The Google keyword tool also give you information on trends (to see if there is any cyclical nature or growth/decline factors) and Cost Per Click (CPC) dollar amounts (which helps you understand the advertising market opportunity). Determining potential sales volume is often tricky. 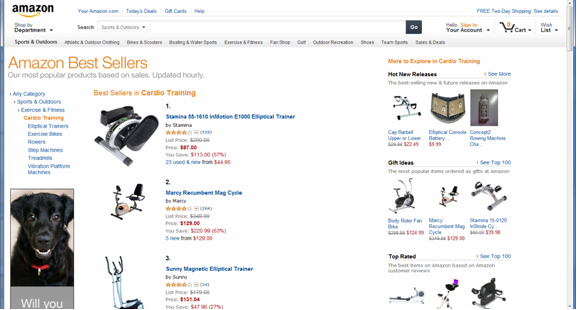 For a product-centric niche (such as “elliptical trainers”) you can go to Amazon.com’s Best Seller section and get a sense of the top selling items (and even compare them to other niches). The Amazon list of best sellers for “Cardio Training” shows a small elliptical trainer as number one, but a “Recumbent Mag Cycle” as number two. Perhaps, a niche around “recumbent mag cycles” is worth exploring…but not before doing more niche research! Another approach to determining potential sales volume is to consider “purchase intent” keywords. A purchase intent keyword (such as “buy”, “purchase”, “reviews”) are keywords that you can add to your niche phrase to understand how many people are looking to purchase something in your niche. Use these purchase intent keywords (buy “NICHE”) in the Google keyword tool to get a sense of the relative sales volume potential of your prospective niche. There are a myriad of ways to do niche research on your competition. I’ll review a couple of free ways and a couple of paid tools that can speed up the process and provide you some more insight. Google, once again, provides good insights into the competition. Simply type your niche keyword into Google’s regular search engine and you can find some valuable information. The first piece of data is the number of search results that is listed right under the search box, and above the search results. This number represents your competition in that it shows the number of web pages that have relevant results for your niche. In general steer away from anything with more than 100,000 results (although as you get more experienced in internet marketing this will not be a factor and there are more sophisticated metrics to evaluate). The niche “elliptical trainer” returns 1,330,000 results – this is enormous, you will never make any headway in this niche. On the other hand, “Dunkel Beer Brands” returns 7,960 results – this is very manageable. Remember: Use your niche in “quotes” to get the number of pages for your exact niche phrase. Established brand names – If all of the top results are from established brand names (i.e., apple.com, ge.com etc.) you will find it very hard to rank. Garbage results – If you see results from completely nonsensical sites (parked domains, one page websites, or websites with completely irrelevant information) this is another good indicator that you will be able to crack the top 10. Market Samurai is the tool that I recommend to help you evaluate a niche (or just specific keywords). I have used multiple tools (including Micro Niche Finder, Niche Finder, Word Tracker, Traffic Travis and a variety of others) to help research and evaluate keywords and Market Samurai is the easiest to use and offers great support to make sure that it is always updated as the search engines are continually evolving. 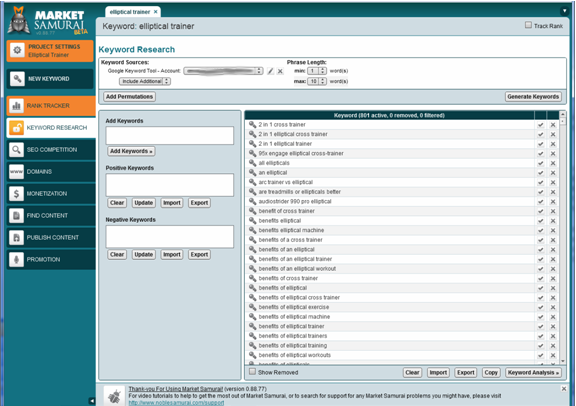 With Market Samurai, you simply enter in a keyword and it will automatically create a list of related keywords using Google’s keyword tools. You can easily modify the list by adding positive keywords (words that are required to be in the results) or negative keywords (words that cannot be in the results). You can also specify a minimum and maximum phrase length to help you keep the list manageable. Even better, you can filter your results for most of these metrics, sort them, and export them to Excel for further analysis. My personal favorite metric is SEOTC which is the number of webpages globally that have the entire search phrase in the title of a webpage. If the search phrase is in the title of the webpage you can be assured that the webpage is being optimized for that search phrase and is your competition. 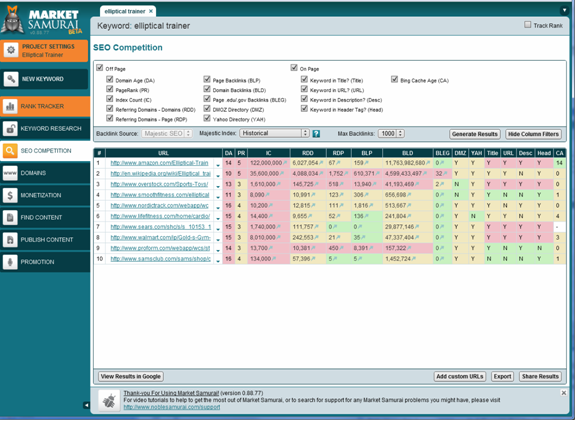 The other nice research/evaluation component of Market Samurai is its “SEO Competition” tool. 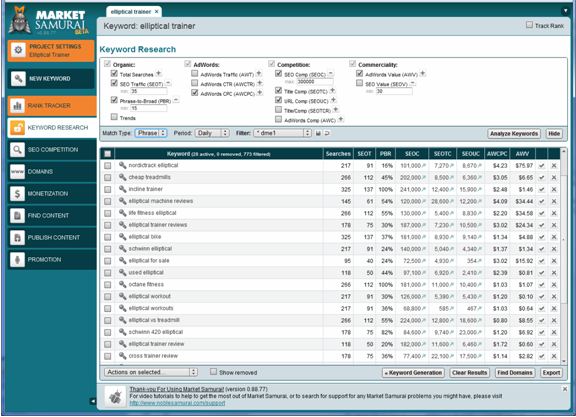 This tool finds and displays the top 10 web pages for your search phrase (niche). It then provides 15 different metrics to help you identify how strong the competition is. It even color codes the results (red, yellow, green) to help you quickly gauge the overall market competition. The final item to consider when evaluating potential niches is…how can I add value to this topic. In other words, is there a void in the market (regarding this niche) that your website or blog can fill. Is there lack of meaningful, objective reviews? Is there no in-depth information freely available on the niche? Are you an expert in this niche? If you are looking for a niche that has long term earning potential, then you must consider what unique value you can bring to the people that are interested in the niche. In Part 2 of the series, I showed you how to develop a short list of Niche Ideas. I’m a big fan of Market Samurai…use it all the time for niche research. You mention using SEOTC as a metric in Market Samurai. What is a “good” value to target? Excellent question Nick. Market Samurai actually has some new metrics based off of the Majestic Index. My new favorite metric is MSEOTC which is the number of pages in Majestic’s index that mention all of the words in a keyword term in the title of the page (it’s basically the same as SEOTC but using Majestic’s index). My target value depends a lot on the website I am considering. If it’s one of my more authoritative sites I’ll use a higher number (~10,000). If it’s a relatively new site, then I use a smaller target value (less than 3,000).